An aerial picture of a Sperm Whale in the waters off Kaikoura on the South Island of New Zealand lets one see how massive this species of whale is. 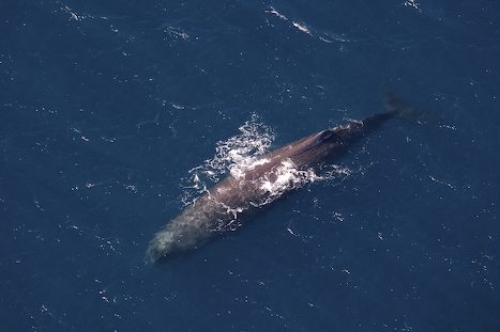 It is hard to get a true picture of how large a Sperm Whale actually is when on the same level but when soaring above, the aerial views are incredible. Flying with Wings over Whales off Kaikoura, New Zealand you can pass above these magnificent mammals and capture a picture as they peacefully rest on the surface of the water. While the Sperm Whale takes a break and rests for a few minutes, the backside of the whale appears above the water while his tail and head sink below. The water swooshes off his backside creating a white foam while the rest of the blue water ripples around his massive body. ... While resting, a Sperm Whale will spout between three and five times within a minute, but when they decide it is time to move on, a stream of water will shoot out of his blowhole, some of the water spray reaching up to fifty feet into the air. While on the move, the blows increases to six or seven times per minute after a long dive. This aerial picture gives you a good look at the dorsal fin that sits about two thirds of the way down its body in a triangular shape. Patience is very important while whale watching as a Sperm Whale can disappear for a good hour before resurfacing and then it is only for about eight to ten minutes. In the waters off Kaikoura, New Zealand chances of seeing these whales are about 95% positive as they linger around these waters on a regular basis. The flight with Wings over Whales is approximately thirty minutes duration and they are located about eight kilometers south of Kaikoura, New Zealand. A worthwhile adventure that whale lovers should take while visiting the South Island of New Zealand. The disappointment after your flight is minimal due to the high percentage of aerial sightings of the Sperm Whales along with the magnificent scenery you will encounter while in flight.